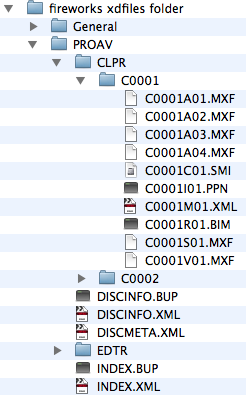 Why is the file structure different coming out of a pdw-u1 vs a 355? Both are going to a mac laptop. 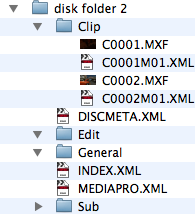 Mac/FCP can use either one. The PC needs the shorter one. The file structure in the first is what appears when there is a problem with the computer recognising the drive correctly. Out of date firmware, incorrect drivers, incompatible operating system, or combinations thereof. Yeah, I've had lots of problems with getting drivers for the U1 correctly installed. Only yesterday I was struggling for around 4 hours trying to get the latest drivers working on XP. That first drive structure shows up when the Sony drivers aren't getting loaded (it's the physical structure of the disc before the sony drivers re-format the layout that you're seeing I believe). I've found that you have to be very meticulous about removing the drivers, disconnecting the drive, rebooting, re-installing, rebooting and they finally re-connecting the drive. Even then, after inserting a disc, you may need to re-boot again. The drivers, IME, are very fussy! Oh, and if this is on Windows 64 bit of any kind, the drivers won't work until the 64bit update is released (apparently September possibly - last time I asked). I did try on Vista 64 bit and the drivers appeared to install but didn't load and I saw the same drive structure as you're seeing.